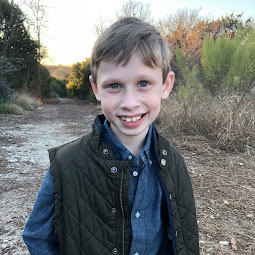 Bennett Brinson Gamel: Fighting Cystic Fibrosis: Going to "Summer School"
Some big changes have happened in our family this month. First, we decided to place Bennett in school with big brother Oliver this summer. The school calls it "summer camp" but it's the same as school to us. It has been helpful to keep Oliver on a similar schedule as during the school year and it's nice for Bennett to get play time with little friends. For me, its an opportunity to get errands done! 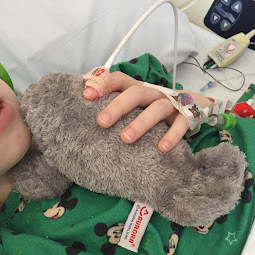 Over the last few months, as we have seen Bennett's feeding issues improve, Brian and I have begun discussing the idea of allowing Bennett to go to school a few days a week with Oliver. Oliver thrived in his Pre-K 3 class, so we wondered if Bennett do really well there too. However, our hesitation with regards to school has always been how to address this issue in the light of Bennett's Cystic Fibrosis. 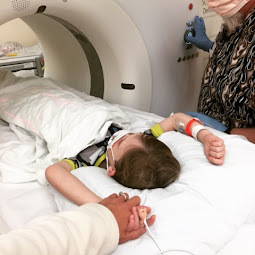 Brian and I talked with Bennett's doctor about the idea of Bennett going to school this fall and we all agreed that a summer school program might be a good first option. It would allow us to "test" how Bennett does in school before having to address our biggest fear: cold and flu season. c.) if Bennett will eat well enough at school that he doesn't lose weight. Our hope is that if we can resolve some of these important issues during the summer, the main issue we will face in the fall is just keeping Bennett healthy and away from colds/flus. These little "Inch Bug" nametags we bought for the boys water bottles work really wonderful for Bennett's enzyme bottle of medicine that sits on his teacher's desk each day. The nice thing is that the boys' preschool has a little refrigerator in the room so we are able to keep his applesauce there. Bennett takes a two enzymes and a spoonful of applesauce before each snack and lunch. So far, they haven't had any trouble with giving them to him. In Bennett's bag of "extra clothes" at school, we placed an extra g-tube and syringe. The teachers have been wonderful with our request that they know how to change out of the g-tube in case it ever comes out. It has been so lovely to see how the teachers have reacted to our new transition. They love Bennett and are more than happy to do whatever it takes to make sure I feel he is safe and well cared for. My most favorite day so far was one day last week when Bennett came home from school and had a nearly empty Lunchable in his lunchbox. I had to ask the teacher if my eyes had deceived me. Typically, Bennett returns home from school with his uneaten lunch so I can monitor how much he is eating. This day, he had actually eaten almost all of his lunch. I was shocked. The teacher said she felt it was a combination of Bennett enjoying eating with his peers and some light encouragement from his teachers. Brian and I were thrilled to learn Bennett might actually be eating better at school. Overall, both boys are doing really great with their "summer school" program. It's been really wonderful for me as it's one of the first times when both boys' needs seem more manageable than ever. No longer am I simply trying to make it through the day. Now, I am actually starting to look forward to what the future holds. We have seen Oliver's anxiety go down tremendously in the last few months. And Bennett's CF is fading more and more into the background (despite small hiccups here and there). On a side note, both boys are showing signs they are growing up fast. Oliver surprised us yesterday when the hair stylist who was cutting his hair asked him if he would count backwards from 10 and he did! And Bennett, demonstrating his 2-year-old will in all of its glory, has become quite adept at communicating the word "no" but is also doing a very good job complying with our requests visit in the time-out chair when necessary. Despite this, he frequently reminds us "I kind" to which we are usually able to reply, "Yes, you are being very kind and loving." The boys, Brian and I played a round of "Hi-Ho Cherry-O" and Shape/Color Bingo today. It's really delightful that even little Bennett can now join us playing a game as a family. I'm really enjoying the fact that both of them are in the preschool stage. 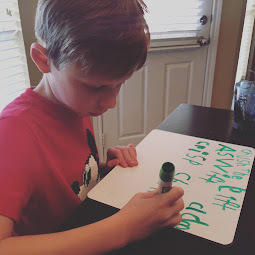 As much as I don't want to see them grow up, I am thankful for our reaching a new stage in life where CF isn't a daily stressor and both kids can do so much more independently! The thought of preschool is one of my biggest worries/fears, and we still have a way to go before worrying about it. That's great that Bennett's doing well so far! I hope the rest of the summer goes smoothly for him!